Increased shale gas production as well as a December that is on pace to be the ninth warmest nationally since 1950 has natural gas prices in the U.S. plummeting by 18% in the last three months. Natural gas futures for January delivery fell to $3.144 per million BTU on the New York Mercantile Exchange. These all suggest that a crisis in the New England energy market caused by natural gas price spikes will be less than many predicted this winter. To be clear, to this point the New England energy “crisis” has largely been a winter phenomenon. The chart below shows the weighted average price of natural gas for electricity generation in New England and the U.S. It shows, natural gas prices for electricity generation are roughly the same in New England and the U.S. with the exception of the winter months, when increased demand for home heating along with the region’s increased reliance on gas-fired electricity generation combine to exceed the capacity of the limited natural gas pipelines in the region. The result is a limited supply and exceptionally high natural gas prices for power generation in the region. As the chart shows, the premium (over average U.S. prices) paid for natural gas by New England power producers has increased each of the past several winters. Abundant supplies and lower prices nationally and a winter forecast of 11% higher mean temperatures compared to the Winter of 2013-14, will lessen but not eliminate natural gas issues or the larger issue of longer-term energy production in the New England region. 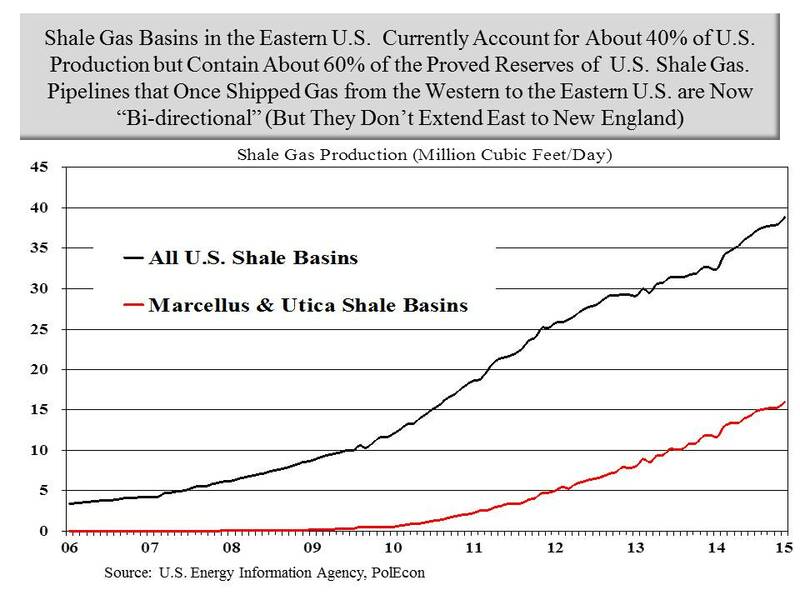 The chart below graphically depicts perhaps the most fundamental problem confronting the New England energy market, one that currently prevents the region from fully realizing the benefits of our nation’s booming production of natural gas. The chart highlights the dearth of natural gas pipeline capacity in the New England region compared to most other regions, including much more sparsely populated regions of the country. There is a reason the chart shows a concentration of pipelines in Ohio, West Virginia, Pennsylvania, and other nearby (to New England) Eastern states. These states currently produce about 40% of the nation’s shale gas but they promise to produce an even greater percentage of the nation’s gas in the future. Together, these states (along with small amounts from states near them) hold over 60% of the proved reserves of shale gas in the entire U.S. according to the U.S. Energy Information Agency. 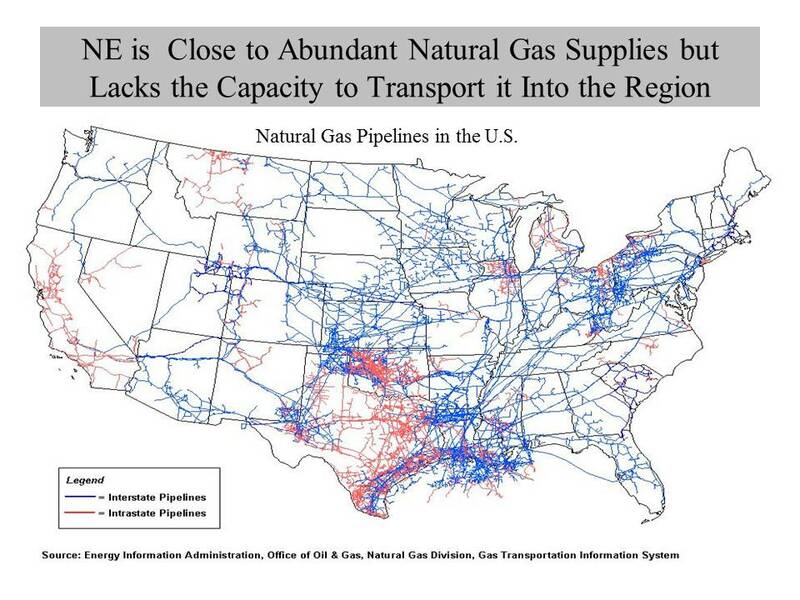 Unfortunately, the chart also shows that the increasing number of pipelines emanating from the region don’t make their way into New England. When the U.S. was more at the mercy of the exigencies of the world’s energy suppliers than it is now, New England had someone to blame for its energy disadvantages. With an emerging abundance of natural gas so close by, it is more appropriate to ask ourselves why we don’t benefit from the boom in nearby production. New England is not a region that produces its own fossil fuels but few areas of the country do and they still manage to avoid the sort energy “crises” that periodically plague New England. To the extent that there is an energy “crisis” we have nothing or no one to blame but ourselves. 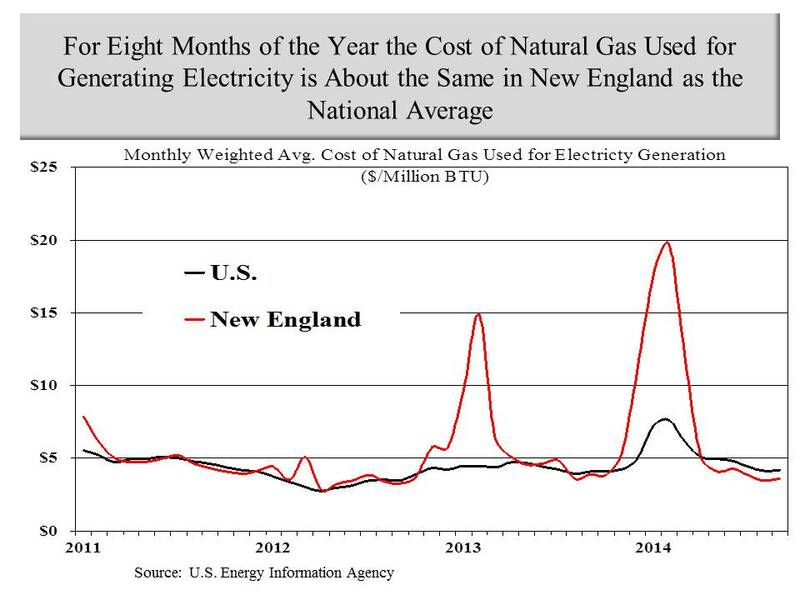 Natural gas is generally more expensive in New England but not always for electricity generation, except during a few months of the year when pipeline constraints are the culprit. New England is “retiring” older “base-load” power plants but so are many other regions – seven coal-fired power plants that I know of in Ohio and another five in Western Pennsylvania alone. But these are also states where new gas fired power plants or other generating facilities are being built to replace them and neither of these regions is straining their natural gas pipeline capacity by adding new, gas-fired power plants. I have done studies for three new gas-fired power plants in Ohio in recent years and although subject to just as much regulatory and public scrutiny, none of the facilities faced the kind of parochial opposition characteristic of most proposed projects in New England. I have also done work on a wind energy project in New Hampshire and it faced as much or more opposition as would any fossil fuel generating project. In New England it seems, any energy project with a public benefit is seen as synonymous with trampling some individuals’ rights. Whatever the extent of the looming energy crisis in New England it is of our own making. If you don’t want renewable energy production (wind, solar, hydro etc. ), gas-fired power plants and the pipelines needed to support them, or any other power producing facilities built, you have no right to complain about the availability or cost of energy in the region. Personally, I would like to see more renewable energy produced in New England and New Hampshire but that doesn’t mean we should refuse the benefits from a greater supply of natural gas. If we do, we will only put ourselves at a greater energy disadvantage than we already face. There are many reasons (aesthetic, environmental, etc. technical) why renewables are not a more favored option for generating electricity in the U.S. but most of the arguments in opposition are based on costs. Too often these arguments are made by ideologues, vested interests, and others with an agenda, most of whom have no idea of how to measure the true cost (levelized cost of energy or LCOE) of production by different generation sources or the hidden as well as direct subsidies provided to each. Despite highlighting the increase in natural gas production this is not a post about the merits of hydraulic fracturing. In the coming years the benefit/cost calculus of “fracking” will be refined. This post is about whether New England will realize any of the benefits that result from an increasing supply of natural gas in the country. I have written before that I do not believe energy prices are the root cause of New Hampshire’s recent slower economic growth (we have had high relative energy prices during the state’s boom periods and New Hampshire is producing more goods and services with a lower energy content per dollar of gross state product than ever before). But even if not a savior, a more stable and abundant supply of energy resources at lower prices would have real economic benefits. Whatever your views of its merits, there is little doubt about the impact of the boom in shale oil and gas production on U.S. energy independence, it will no doubt alter the economic, fiscal and the international geo-political landscape of the country. In ten years it is quite possible that the only nation from whom the U.S. imports oil is Canada. Whether the shale oil and gas boom also alters the prospect for NH’s energy and economic future is less certain but is almost entirely within our control.